When reporting individually on multiple Business Units, Calxa generally inserts a page break after each Business Unit report. There are circumstances where you may wish to remove this page break, for example where each Business Unit report is very short and you could fit multiple Business Units on one page. This help note will guide you through the process of removing page breaks from report templates via the Report Designer and assumes that you are familiar with the Report Designer. If this is not the case, please read Report Designer: General Concepts first. Open your chosen report template in the Report Designer. This example will be done using the Budget Summary report with the Budget Summary template. Select the Detail1 Control (where you see BusinessUnit.BusinessUnitName). Now look at the Property Grid at the bottom right hand side of the screen. Scroll down to the Behaviour section and change Page Break to None. 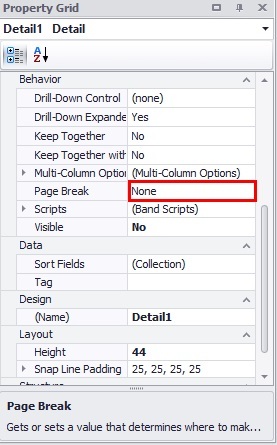 To do this click into the box next to Page Break (where you see Before the band, Except for the First Entry). A drop down menu will appear where you can select None. Close the Report Designer and run the report with the template you just edited to ensure that the page break has been successfully removed.